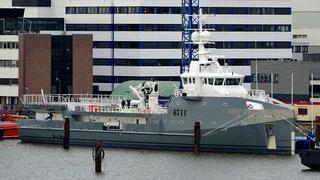 The second 67m Sea Axe superyacht support vessel has been launched. Netherlands-based superyacht builder Amels, part of the Damen Shipyards Group, manages the sales and marketing of the Damen-built axe-bow support vessels. The second 6711 Damen Sea Axe Fast Yacht Support vessel is a sistership to the first 6711 series Sea Axe Garçondelivered in September 2012. The standard configuration of the 67m Sea Axe specifies 235 square metres of deck space, not including the helipad, for carrying toys and tenders. Built in steel-and-aluminium, the 6711 is also designed to host up to 21 crew members and support staff. Sold by Amels in December 2012, the just-launched 6711 Sea Axe hull No 2 stands out from her predecessor. The new launch has been designed specifically for scuba diving expeditions and features extensive scuba diving facilities. She is also equipped with an LY2-certified helipad, with a maximum take-off load of 5,000kg and a D value (diameter) of 14, allowing it to accommodate a Eurocopter Dauphin or Augusta Grand. The crane is also beefed up, boasting a maximum working load of 6.6 tons and a reach of 16.6m, which will allow the crane to safely manoeuvre a large tender such as a 12 metre superyacht tender weighing 11 tons. The 6711 is the flagship of the Sea Axe range, followed by the 50.3m Sea Axe 5009, with Umbra sold this October, and the design for the smaller 37.7m Sea Axe 3707.